How wide a tire can I fit on this bike? It’s a common question, especially when converting a bike from one wheel size to another. Hahn Rossman’s Tire Fit Gauge eliminates the guesswork: One end hooks over an axle placed in the dropouts. The other end has slots for three wheel sizes: 559 mm (26”), 584 mm (650B) and 622 mm (700C). Discs that represent different tire widths fit into the slots: 23, 34, 38, 42, 48 and 54 mm. Slide a disc into the slot for a rim diameter, and rotate the gauge around the axle to check the clearances for this tire size all around the frame. Designed for 13 mm dummy axles in frame jigs, the Tire Fit Gauge can be used with other axles if their diameter is increased with a few layers of tape. 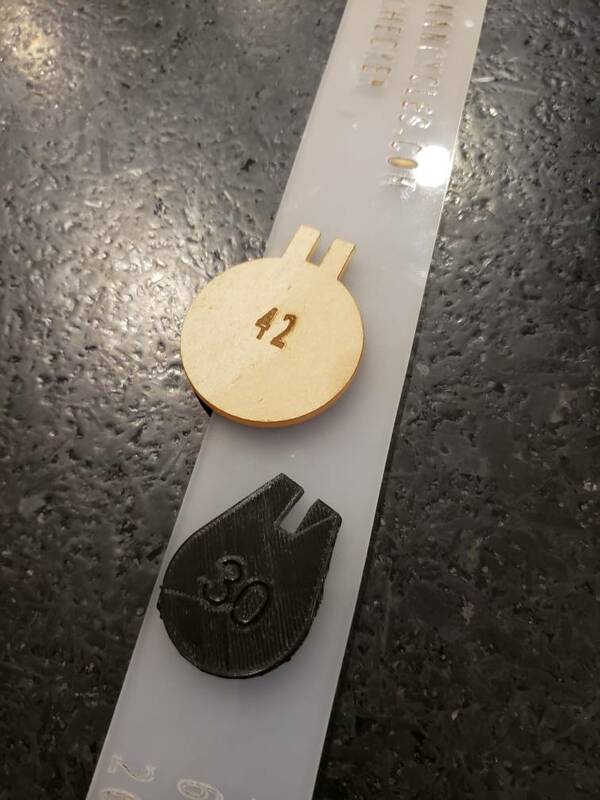 The gauge is laser-cut from plastic. Remove protective cover before you use it. Or...2 tablespoons are about what, 42mm? Just guessing actually a pretty good idea. thats cool. better than buying a set of tires to try them on only to find out they dont fit. But why the gap between 23 and 34? Doesn't a builder want to know if a frame can clear 28 or 32? I like the idea, but what about the many varying tire/rim combos? If fit is questionable it seems easier to have a pair in your tire stock (or borrow from a pal) to physically check to be 100% certain. I'm not sure it's totally useless. I think it might be useful to know if you're considering a wheelsize swap, as he states. If you're wondering about feasibility of a wheel size change (700x23 to 650b x something) then this might be a useful gauge that allows eliminating of the possibilities. I don't think it'll guarantee fit, but it might guarantee not fitting. This tool is for framebuilders that want to measure tire clearance while working on tube layup in the jig. Hahn is an accomplished framebuilder - I doubt he would develop and then market a useless device. Last edited by xnetter; 12-16-2018 at 01:09 PM. A friend of mine took dimensions of the sized pucks, and created and scaled cad designs for different sizes. I think it's scale-able to any size? Not sure. I think he uploaded it to thingiverse. Once I find that link, I'll update it here.